Large rooms can be difficult to keep warm depending on a few different factors. Things such a how well insulated a room is and how cold it is outside all can effect how well a it stays warm. Indoor heaters are a great way to help supplement an existing heating and cooling system and even keep a room constantly warm with the right setup. With that in mind below is some of our picks for good large room heaters. 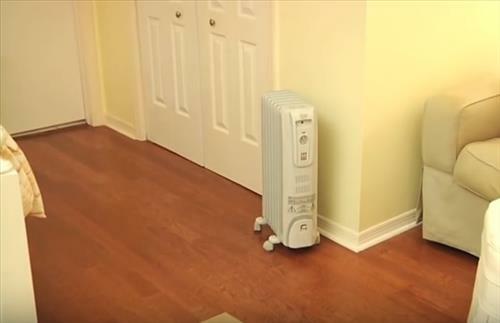 Oil-Filled Radiator heaters are great for large rooms since the heat radiates out. They do not use a fan to blow hot air away from the unit with the heat slowly flowing outward. A nice thing about oil filled heaters is that they are cheaper to run than resistant based units that glow red hot. They do take longer to heat up usually 5-10 minutes and longer to cool down. Most all units are never too hot to touch and will not burn something if something accidentally touchs a unit. Still they do get very warm and will need plenty of space to send out heat. Wall mounted heaters are becoming very popular since they take up no space and work well. They do not put out large amounts of heat but work by steadily heating a space keeping a constant temperature. Since they do not put out large amount of heat they are often used as a supplement to a bigger heating unit. They can help keep electrical cost down since larger units use a lot of energy to cycle on and off. More than one can be used for a room that needs more heat. Ceramic based units use resistance along with an element much like an older incandescent light bulb does. The element heats up very quickly with different settings for controls such as Low, Med, and High heat. They are many units available such as the Lasko 760000 which work very well in helping to heat a large room. Most all units will have a fan along with high and low settings depending on the unit. Different types of wall mounted units are also available which are setup on a wall out of the way. This is good in any environment were a heater may get in the way or take up needed space. There many wall unit heaters that come in all shape and sized along with voltage requirements, 110 volt or 220 volt. The above are a few examples of heaters that can be used in large rooms to help it to stay warm. The type of unit used is very much a preference with any type able to put out heat. Oil based units work very well and quietly at putting out a steady heat that works very well at maintaining a temperature. Resistant type heater work much faster kicking on and off at the temperature the thermostat is set on. Wall units are also a good permanent option that after being setup are up and out of the way making them ideal in many scenarios.